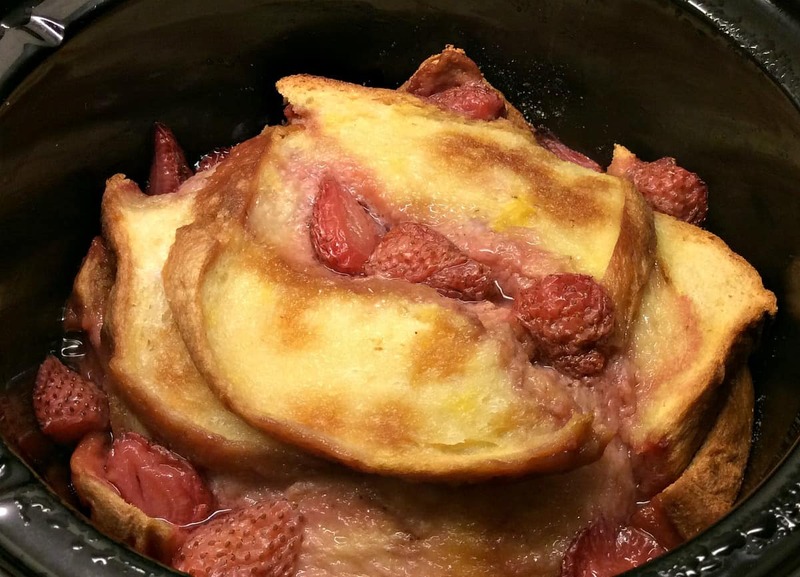 Delicious brioche and strawberry pudding made in the slow cooker! Why not treat yourself to a summery dessert that is so easy to make. Although it seems to be summer now (at last, hasn’t it been a long time coming), I think there are still times when you need a good, comforting pudding. 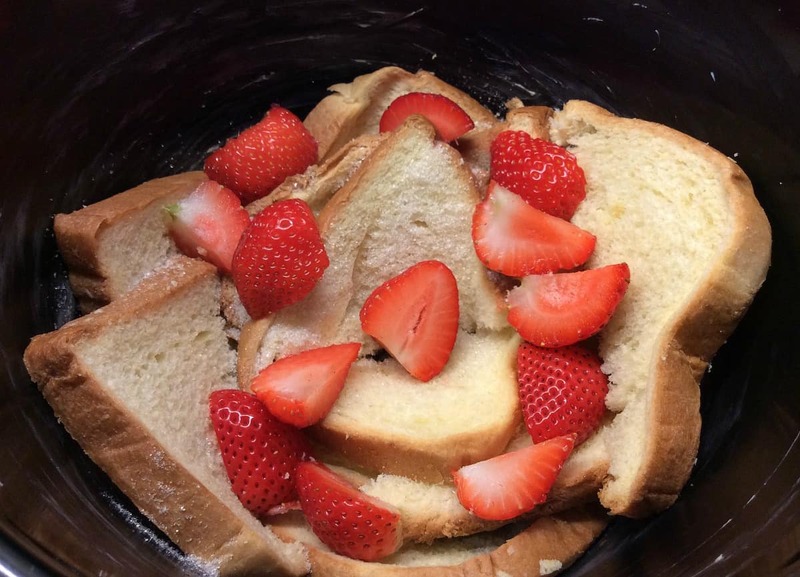 I had half a brioche loaf to use up, as well as some freshly picked strawberries, so this slow cooker brioche and strawberry pudding was born. 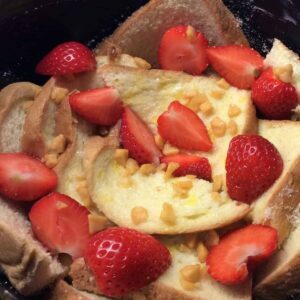 The buttery brioche loaf and sweet strawberries were delicious together. Simple desserts are sometimes the best aren’t they? In summer we get through a lot of strawberries, often on their own, but it can sometimes be good to change it up a bit and try something a bit different. We thought the brioche loaf added an extra dimension which you wouldn’t get with a normal white sliced loaf. Bread and butter pudding works very well in the slow cooker; for another version have a look at my slow cooker panettone bread and butter pudding for the winter. Puddings like this are so easy to make, just put the ingredients in the slow cooker and forget about it for a couple of hours. My kind of cooking! Pure comfort food. You can’t beat a crockpot dessert! 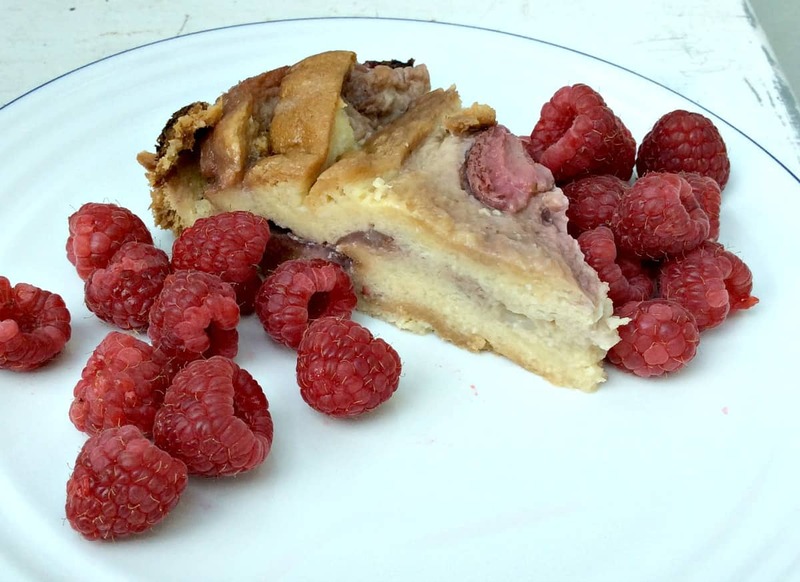 Delicious served warm with custard or even chilled with more berries. This fruity spin on a bread and butter pudding is delicious in winter or summer alike. Grease the bowl of your slow cooker with butter. Cut the brioche slices into triangles. Put half of the brioche triangles in the pot, arranging them around the sides. 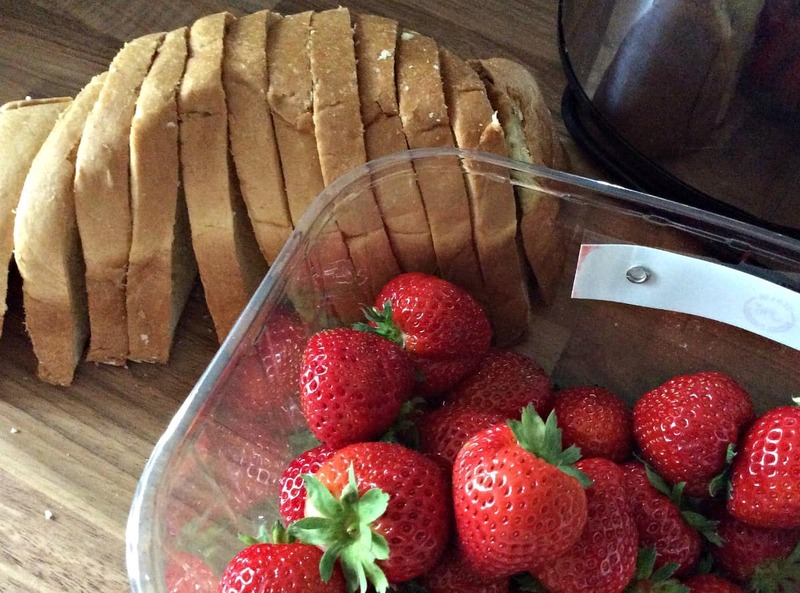 Top the brioche with 1 tsp caster sugar and half the strawberries. Put the rest of the brioche triangles on top, and sprinkle over the second teaspoon of caster sugar. Whisk together the eggs and milk and 3 tsp of caster sugar in a jug. Pour the mixture over the brioche, and place the remaining strawberries on top. Sprinkle over some honeycomb pieces. Put a clean tea towel under the lid of your slow cooker (I used a 3.5 litre round slow cooker here), and put the lid on. Fold up the sides of the tea towel so it doesn't hang over the sides. Cook for approx. 2 hours on high, or until the custard is set and the pudding is starting to brown. Tip: The time needed really depends on your slow cooker and how hot it cooks, so keep an eye out and check your pudding regularly. well this is just like the coming together of some of my favourite things in the world… slow-cooking, strawberries and bread and butter pudding! Who knew you could do a B&B pudding in the slow cooker… utter genius and a wonderful entry for Simply Eggcellent, thank you for the link-up! Thanks Dom, thanks for hosting a great linky! Ooh, I bet that was good Lucy. I know I’ve said it before, but I’ll say it again – I really must unearth my slow cooker! Thanks Camilla, where is the sun? Yuuuuummmmmmmmmm when I saw this all over your social media I got very excited. Brioche and bread and butter pudding are a great combo. I can’t say I’ve ever tried it in a slow cooker before so I’ll have to give it a go. Fab, hope you like it. Would be good in the oven too I’m sure. Wow! I love the idea of brioche in b&b pudding and the strawberries gives it a real summery feel!